Based in Louisville, Kentucky, Texas Roadhouse opened its doors in 1993 and has more than 525 locations in 49 states and seven countries. The family-friendly restaurant is famous for hand-cut steaks, made-from-scratch sides, fresh-baked bread, and a lively atmosphere. Texas Roadhouse was consecutively voted #1 Steak by Nation’s Restaurant News Consumer Picks Survey in 2015 and 2016. Restaurant Business named Texas Roadhouse the #1 Full-Service Chain in Sales and Satisfaction in 2016 and most recently, the company was recognized as one of America’s Best Large Employers by Forbes. 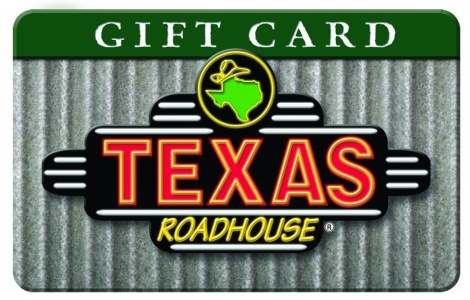 Redeemable only at U.S. Texas Roadhouse restaurants. Not valid for internet purchases. No fees. No expiration date. Not a credit or debit card. Remaining value of damaged, lost, or stolen cards only replaced with proof of purchase. Not redeemable for cash, except as required by law. For complete terms or questions, visit www.texasroadhouse.com. Armadillo, Inc. or its successor or designee is the card issuer and sole obligor to the card holder. Another party may be substituted as the card issuer and sole obligor without card holder’s consent. Purchase, use, or acceptance of card constitutes acceptance of these terms. For questions regarding Texas Roadhouse please contact 1-800-TEX-ROAD.